Tonight, in FC Barcelona's massive stadium in Barcelona, more than 60 groups (comprised of more than 450 artists!) will sing in a concert called “Concert per la Llibertat” or Concert for Freedom in support of Catalonia's desire to hold a referendum on independence from Spain. It sold out faster than Bruce Springsteen, though more seats were opened up afterwards behind the stage. Almost 100,000 will be in attendance. Music has a long history of political action, both within and outside Catalonia. @MoltDeleros tells me that "for many years, lyrics with hidden meaning were the only way to defend our country and our way of being". The songs in the concert, he says, mostly come from poetry, some Catalan, some not." so that the dream we share can come true. that can help us go farther, toward learning the art of life. The Concert per la Llibertat was organized by Omnium Cultural and the Catalan National Assembly. Many news outlets have published the complete list of the participants and the songs they'll sing. 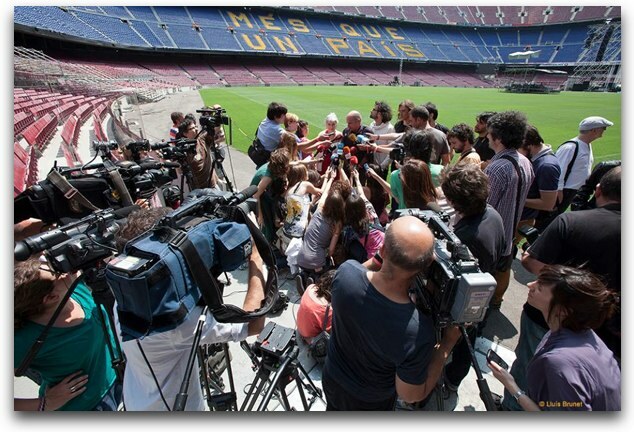 TV3 will retransmit the concert live on huge screens all over Catalonia as well as via Internet. It will also be broadcast via radio. Groups in Québec, London, Brussels, Santo Domingo, Paris, Mexico City, Buenos Aires, Edinburgh, Lausanne, and Cologne will gather to watch it together. Yesterday, on El Món a RAC1, the presenter and guests talked about who would be there and who would not. Indeed, representatives from all of the major political parties except PP will be there and the Catalan government is sending a delegation (minus the president who is at his daughter's wedding). The leader of the Catalan branch of Spain's ruling Partido Popular, Alícia Sánchez-Camacho, however, said, “Today's concert is a concert about rupture, exclusion, and division of all Catalans, and the Partido Popular will not allow it.” She then likened the concert to a witch's coven (!). Some of the musicians have complained about receiving pressure not to perform at the concert. Dyango, a well known crooner famous for singing “Suspiros de España (Sighs of Spain)” said “he had received threats of all kinds”. When question about that song in particular, he said that he had sung many love songs in his day, and hadn't meant all of them literally. Concert-goers who bring a non-perishable food item for the Food Bank will receive a commemorative bracelet. The human chain will link municipalities in Catalonia between Pertús and Alcanar. The organizers have invited Valencians and Northern Catalans to continue the chain. The Catalan National Assembly and Omnium Cultural announced yesterday the path of the human chain for independence that they are organizing for next September 11th. It will begin at 17:14 (commemorating the year the Catalans lost to the Spanish and French) and the chain will join Pertús in the Pyrenees with Alcanar at the southern tip of Catalonia, and will go mostly through towns near the coast and a few county seats: Figueres, Girona, Matarò, Sant Feliu de Llobregat, Vilafranca del Penedès, el Vendrell, Tarragona, Reus, and Amposta, and will also pass through the city of Barcelona, along many of its principal avenues, including the Diagonal, and through the Gothic Quarter (including Sant Jaume square, where both the Catalan and city government are situated) and the Eixample, among other neighborhoods. These are the towns through which the human chain will pass: El Pertús, la Jonquera, Pont de Molins, Figueres, Santa Llogaia d'Àlguema, Bàscara, Orriols, Bàscara, Sarrià de Ter, Sant Julià de Ramis, Girona, Fornells de la Selva, Riudellots de la Selva, Tordera, Pineda de Mar, Calella, Sant Pol de Mar, Canet de Mar, Arenys de Mar, Caldes d'Estrac, Sant Andreu de Llavaneres, Mataró, Vilassar de Mar, Premià de Mar, El Masnou, Montgat, Badalona, Sant Adrià de Besòs, Barcelona, l'Hospitalet de Llobregat, Esplugues de Llobregat, Sant Just Desvern, Sant Feliu de Llobregat, Molins de Rei, Sant Vicenç dels Horts, Cervelló, Vallirana, Ordal, Cantallops, Sant Cugat Sesgarrigues, Olèrdola, Vilafranca del Penedès, Santa Margarida i els Monjos, la Ràpita, Castellet i la Gornal, Bellvei, l'Arboç, Coma-ruga, Creixell, Clarà, Torredembarra, Altafulla, Tarragona, Reus, Riudoms, Montbrió del Camp, Mont-roig del Camp, L'Hospitalet de l'Infant, l'Ametlla de Mar, El Perelló, l'Ampolla, Camarles, l'Aldea, Amposta, Sant Carles de la Ràpita and Alcanar. The ANC has opened via.assembla.cat, with information about the "Catalan Way" which is identified with the #viacatalana hashtag on Twitter. Next week, people will be able to sign up to participate in a specific section of the path. How did they choose the route? The ANC explained why they chose the route, which mostly goes through coastal counties, and skips the interior, mountain ones, and Eastern ones, and also does not go into Valencia or North Catalonia. 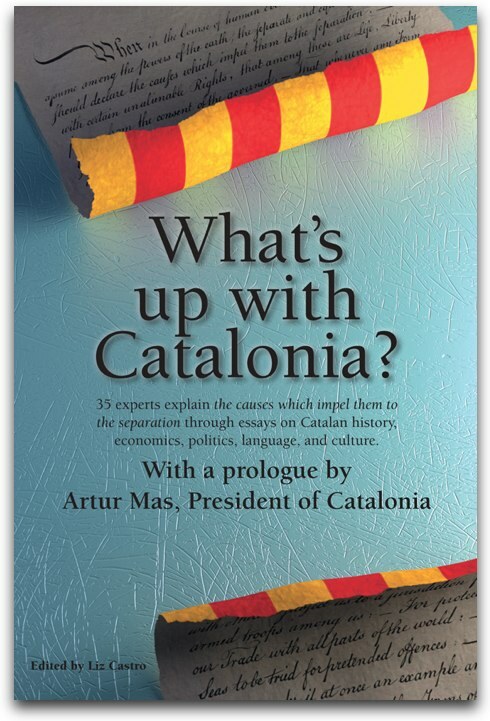 “It is the backbone of the Catalan Countries, and the ancient ‘Augustan Road’. That way the people of Valencia and North Catalonia, even though it's a work day, can continue the path in their territories. The Balearic Islands will also be able to have concurrent celebrations,” explained the group. The ANC president, Carme Forcadell, explained yesterday that the September 11th demonstration last year had gone perfectly and that this year the idea was to go further still. “The Catalan Way is a political and logistical challenge,” she added. Forcadell pointed out that the Catalan Way represents the unity of the Catalan people in favor of the independence of Catalonia and that it demands that Catalans be able to “vote for independence in a referendum as soon as possible”. Other speakers at the press conference, held in the Museum of Catalan History, included Rita Marzoa, spokesperson for Omnium Cultural, Ferran Civit and Ignasi Termes, members of the Secretariat Nacional, and two organizers of the Baltic Way of 1989, the Estonians Ülo Laanoja and Henn Karits. Marzoa, representing Omnium, pointed out the unity of the civil society in the process toward independence. Civit and Termes, for their parts, explained the logistical details and the content of the chain. Civit pointed out how important it was that all of the lengths of the chain be connected and explained that if they were able to do that, then the chain would be a logistical success, and also a political one. Civit also explained that the path, which will go along the coast of Catalonia, from Alcanar to Pertús, will also allow the rest of the Catalan Countries to participate symbolically, even though outside of Catalonia it's not a holiday. For his part, Termes said that the process could not be delayed any longer, and that the path of the human chain would be over 250 miles long and would go through 86 different cities and towns in Catalonia.